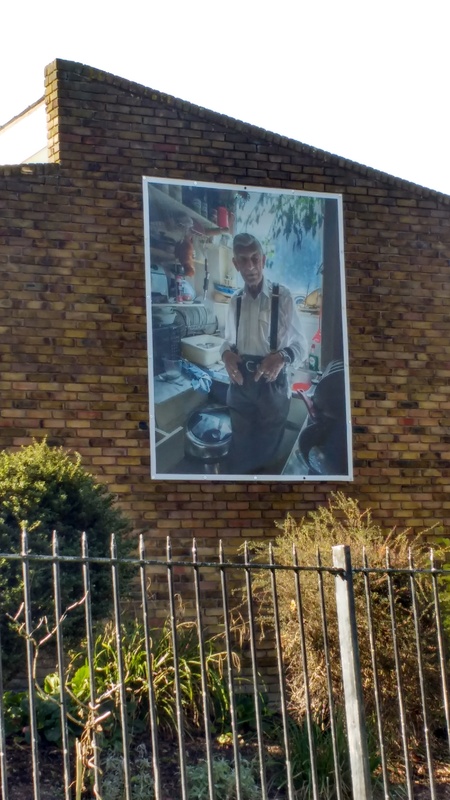 A photo, taken by the author, of one of the PVC portraits depicting a current resident. Cressingham Gardens is a social housing estate designed by architect Edward Hollamby in the 1960s. The estate runs along the side of Brockwell Park in South West London and is comprised of 306 low rise homes from studios to four-bedroom houses, including 12 flats designed for disabled residents. Hollamby designed the estate around a series of interconnected walkways with plenty of trees, well-tended patios and open green spaces that blend into the neighbouring park. Lord Esher, President of the Royal Institute of British Architects (1965-67) described the estate as “warm and informal… one of the nicest small schemes in England”. Cressingham Gardens is a rare architectural model for a well-functioning social housing estate that is enjoyable to live in. The regeneration of Cressingham Gardens is an example of the wider process of gentrification that is happening throughout London. Gentrification affects the prices, diversity and local businesses of an area. According to Zoopla, housing prices in Brixton have risen by an average of 76% over the last 10 years as an influx of young up-and-coming professionals seek out trendy areas. In the 1950s Brixton became home to many members of the Windrush generation of immigrants. The British government encouraged people from the West Indies to come live and work in the UK after World War Two left Britain with serious labour shortages. Then as now, immigrants entering a racist and classist Britain were and are forced to live and work in precarious positions. Since the last census in 2011 Lambeth council has raised £55.65m by selling off its “short-life” housing stock across the borough, which has resulted in widespread evictions. The council claims that the majority of residents were offered other council accommodation and that most were rehoused within Lambeth. Social housing exists to cater for those most in need of accommodation; by selling off and repurposing social housing as luxury office spaces or high-end flats, London councils are forcing the most vulnerable people in society into even more precarious living situations. As housing prices in London skyrocket, the council’s definitions of affordable homes varies wildly from the realities of what many people in social housing can afford. For example, a shared ownership home is officially defined as affordable housing even though it may be priced at normal market rates which, in South West London, are currently very high. Lambeth council plans to demolish the estate wholesale, dispersing the entire community and replacing it with 465 homes, all of which will be more expensive. Residents wishing to come back and live in the regenerated estates will face a rise in living costs across all tenures and a loss of legal rights. Since the demolition was first proposed in 2012 Cressingham Gardens’ residents and supporters have campaigned tirelessly to save the social housing estate. Campaigner Andy Plant writes that “Residents have presented their own scheme for an additional 37 genuinely affordable homes (at council rent levels) on the site, creating a total of 237 social housing dwellings alongside 100 affordable homes, and costing £7.1million”. Residents bought and won a judicial review that stated the council acted unlawfully by removing refurbishment options from the consultation. With the help of technical experts, residents developed and submitted an alternative plan called ‘The People’s Plan’. Only one day after its submission Lambeth Council dismissed the plan and reverted to their decision to completely demolish the estate. Another close-up of another PVC portrait depicting a different resident. 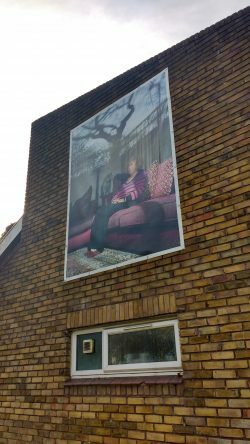 Cressingham Gardens resident Mark Aitken, helped by a £10,000 Arts Council donation, has mounted nine giant portraits of fellow residents onto the threatened homes. The exhibition is called ‘Sanctum Ephemeral’, which roughly translates to ‘safety is short lived’. It is open for anyone who is passing through the estate or the park to see. 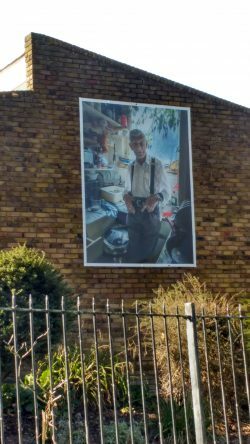 The huge PVC portraits of Cressingham residents mounted on the exterior walls of the estate highlight the future regeneration process as more than just a tearing-down of bricks and mortar. Aitken’s photo of resident John Sergeant in his kitchen made it to the final 100 entries for the ‘Portrait of Britain’ competition. Aitken’s says of his work “The photographs are an exploration of how home as a repository of memory defines identity,”. He adds “We define our homes. Our homes define us”. Aitken’s art has helped draw attention to the community impact that the process of gentrification has as many social housing estates are torn down and replaced with more expensive accommodation. All over London people in social housing are being displaced as new expensive buildings replace their homes. A close-up, taken by Ceri, of one of the PVC portraits depicting a current resident. New stained glass windows by artists Emma Blount, Jenny Sharp and Rebecca Seedhouse were also unveiled for the London Open House Festival to support the campaign to save Cressingham Gardens. Blount’s work depicts a giant multi-coloured sparrow, flanked by many other colourful birds, fighting an ominous vulture that is grabbing at the Cressingham houses. Blount says it represents how the diverse Cressingham Gardens residents are campaigning against Lambeth Council’s destruction of their community. All three stained glass windows highlight the socio-political importance of Cressingham Gardens as a thriving social housing estate and hope to draw attention to the ‘Save Cressingham Gardens’ campaign during the Open House festival. 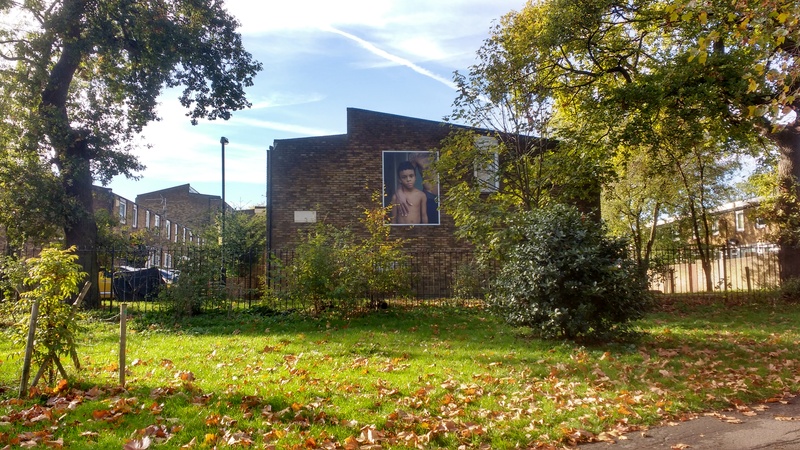 Cressingham Gardens remains an example of the importance of fairly priced and well-functioning social housing within any community. Despite this, countless residents of social housing are being forced out of their homes by the profit-driven regeneration drive of gentrification. Displaced residents have to contend with the loss of their homes, communities and often their jobs as they are forced to seek cheaper accommodation elsewhere. Residents and non-residents alike are coming together to campaign against the governmental attacks on social housing. Therefore the fight to save Cressingham Gardens, and many other social housing projects like it, continues. Ceridwen Mitchell is a fourth year English student at the University of Warwick, who recently returned from a year abroad in Berlin.